If it ain’t broke, don’t fix it. This must have been the motto for the game developers behind FAR CRY 4 as the gameplay for this sequel and even the new story seemed to cruise along familiar waves that were covered in the third entry. 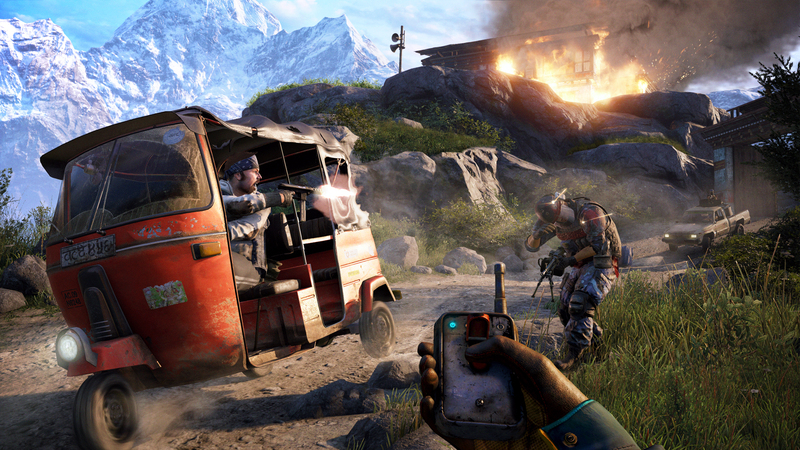 FAR CRY 4 follows its successful predecessor’s mould – There are towers to liberate, there are outposts to free and there are animals to skin to craft items. 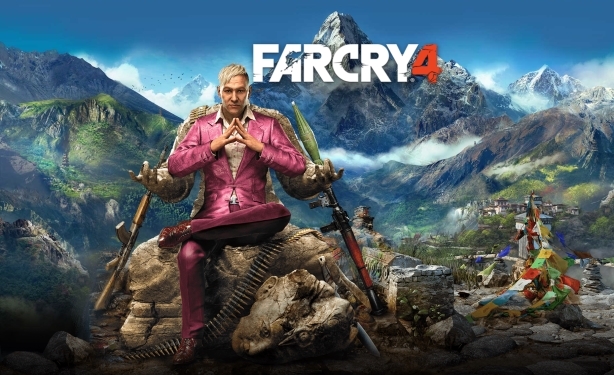 As the protagonist Ajay Ghale, you find yourself between two different factions, much like Jason in the third game, and much like Vaas, the villain from that game, Pagan Min is a mesmerising villain to watch, one that can shift from being eccentric and hilarious to brutal and menacing. Following the blueprint isn’t such a terrible thing, especially when offering up the beautiful world of Kyrat – the majestic mountains, the gorgeous jungles – all of that is there for you to explore at your own pace. So what are the goods? You have a massive, luscious and more importantly – fun – sandbox to play in. Kyrat is a sheer joy to behold and there is a tonne of content for the casual gamer and for the folk looking to obtain 100%. There’s lore of this fictional location, there’s side missions for you regarding the eccentric folk around the country and then there’s the Shangri-La missions that are a blast. If you’re into game soundtracks, take the time between blowing stuff up to listen to the oriental flavoured tunes. It’s a thrilling, bombastic and engaging listen and I for one know I’ll be picking up the soundtrack for this. -The visuals are gorgeous. I love the lush jungles and the breath taking mountains. Exploring the world is fun and engaging. -The FPS mechanics are terrific. It’s fast, fluid and just a blast taking down enemy outposts. This is what the series does best of all. – Riding an elephant into battle? How many games can say they feature that? Smashing the enemy down and flinging them off screen is a lot of fun and a feature within this world that I loved. The story. The story felt recycled and as someone that was invested in it, I was disappointed by how familiar things seem here. You’re a man torn between two fractions up against an eccentric villain while also encountering stranger folk around your location. 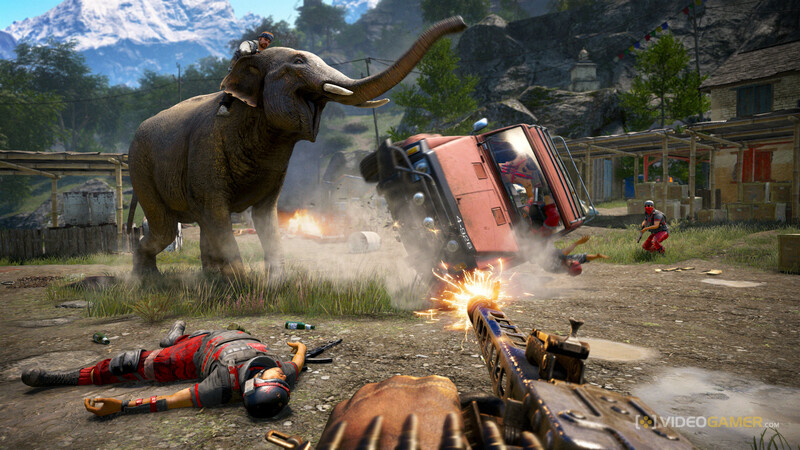 Again – it’s not so much the blueprint of the game that bothers me, it’s just that FAR CRY 4 feels like it’s playing it a little safe with the formula and could’ve benefitted from a few new things here. That being said, there’s always something to do in FAR CRY 4. There’s always something distracting you off the course of the main story, whether it is a rhino charging you or a side quest that pays well. It’s definitely entertaining and a massive game to sink your teeth into. I just feel it could’ve been a little more surprising in its characters and story. Note: CO-OP aspect hasn’t been reviewed as of writing this review.